West Ham United host Premier League leaders Chelsea on Monday evening in a London derby under the lights. The Blues are seeking to maintain their lead at the top while the Hammers are hopeful of consolidating their position in the top half of the table. We take you through our predictions and betting tips for the fixture at the London Stadium. Chelsea’s only defeat outside of the Premier League came in this fixture back in October as goals from Cheikhou Kouyate and Edimilson Fernandes were enough to secure passage for the Hammers into the quarter finals of the League Cup, although the victory was somewhat marred by crowd trouble. A late Diego Costa winner sealed the win for Chelsea on the opening day of the season at Stamford Bridge – although it was controversial, as the Spanish striker could easily have been dismissed earlier in the clash – but that was the Blues’ only victory in four against their London rivals. Last season, Chelsea’s last ever visit to Upton Park ended in a 2-1 defeat while the return at the Bridge was 2-2. Chelsea were unbeaten in this fixture over 13 games lasting from 2004 to 2010, winning eleven. Chelsea have only lost one of their last 21 league outings, although that did come in another London derby – at Tottenham Hotspur. They’ve drawn both of their last away outings, at Liverpool and Burnley although are undefeated this season outside of London. Slaven Bilic’s side have lost only one of their last six league games and have won three of those – their best form of the campaign, although they’ve only kept one clean sheet in their last ten outings. Andy Carroll is expected to be involved for the Hammers after overcoming a groin strain but Gokhan Tore, Diafra Sakho and Angelo Ogbonna are all definitely unavailable. Michael Antonio is suspended following his red card at Watford. Antonio Conte is the league’s only manager to have no injuries or fitness concerns ahead of this round of fixtures. Chelsea are favourites for this clash for obvious reasons but a victory is much less likely than it initially appears. Despite initially struggling to adapt to their new home, West Ham’s results and consistency are improving and they have risen to 9th in the standings on merit. The Blues have shown one or two chinks in their armour recently and this has been reflected by dropped points at both Liverpool and Burnley – two testing away fixtures but this will be a third, and Conte may well be happy to settle for a point away to a geographical rival in strong form. 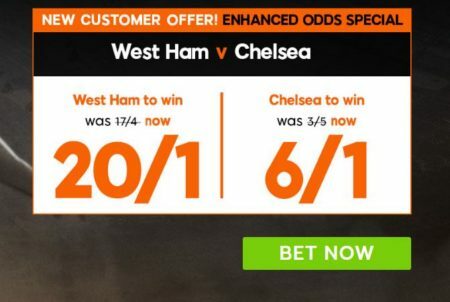 With odds of 16/5 there is value to be had in plumping for the draw – with the added factor of an improved evening atmosphere adding to West Ham’s hopes of taking something from the encounter. Pedro has scored in five of Chelsea’s last eight games including in each of the last three – he is bang in form and an automatic pick, with odds of 23/10 of him netting in a fourth consecutive fixture at a tempting 23/10.